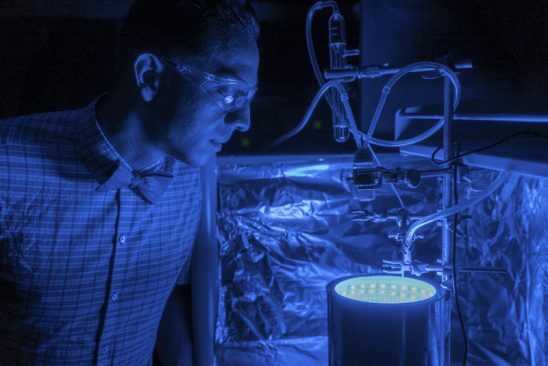 A chemistry professor has just found a way to trigger the process of photosynthesis in a synthetic material, turning greenhouse gases into clean air and producing energy all at the same time. The findings of his research are published in the Journal of Materials Chemistry A .
Uribe-Romo and his team of students created a way to trigger a chemical reaction in a synthetic material called metal–organic frameworks (MOF) that breaks down carbon dioxide into harmless organic materials. Think of it as an artificial photosynthesis process similar to the way plants convert carbon dioxide (CO2) and sunlight into food. But instead of producing food, Uribe-Romo’s method produces solar fuel. To see Uribe-Romo explain the process in his own words, click here. It’s something scientists around the world have been pursuing for years, but the challenge is finding a way for visible light to trigger the chemical transformation. Ultraviolet rays have enough energy to allow the reaction in common materials such as titanium dioxide, but UVs make up only about 4 percent of the light Earth receives from the sun. The visible range – the violet to red wavelengths – represent the majority of the sun’s rays, but there are few materials that pick up these light colors to create the chemical reaction that transforms CO2 into fuel. “The goal is to continue to fine-tune the approach so we can create greater amounts of reduced carbon so it is more efficient,” Uribe-Romo said. He wants to see if the other wavelengths of visible light may also trigger the reaction with adjustments to the synthetic material. If it works, the process could be a significant way to help reduce greenhouse gases. Other members of the team who worked on the paper include UCF graduate student Matt Logan, who is pursuing a Ph.D. in chemistry, and undergraduate student Jeremy Adamson, who is majoring in biomedical sciences. Kenneth Hanson and his research group at Florida State University helped interpret the results of the experiments. Hopefuly this would be something that killing-planet companies would accept to invest on.